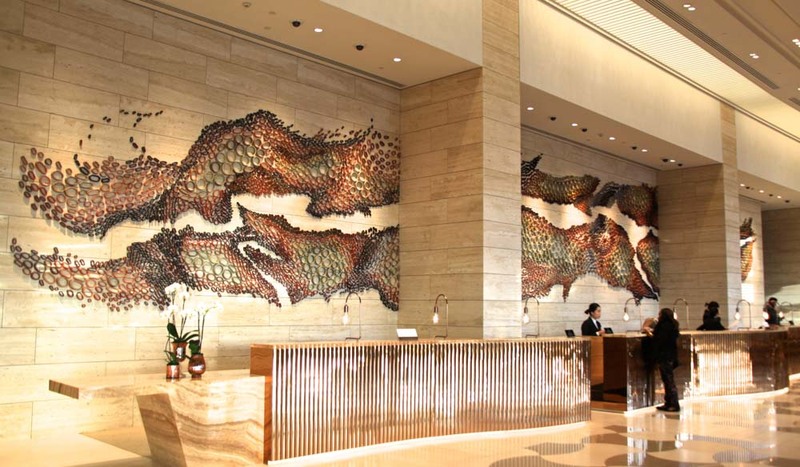 Ceramic mural of the Swan River, Crown towers lobby, Perth (photo: Fleur Bainger). What’s it like to stay in the most expensive hotel ever built in Australia (with no need to leave, um, ever)? Fleur Bainger staycations in the bubble of Crown Towers’ parallel universe and asks: is it really as good as it sounds? I feel like I’ve been shrunk, and it’s a strangely wondrous experience. Miniature me is gaping up at the ceiling where insets of giant, leather-like plaits resembling a luxury handbag puzzle the brain. What on earth are they for? If simply to impress, they’re nailing it. As are nearby feature chandeliers made from 20,000 metres of ball chain, each weighing three tonnes. The polished travertine floors beneath my feet – covering 8500 square metres across the entire hotel – are cut into a pattern of cartoony Australia shapes. Textured, tactile surfaces are everywhere I look. 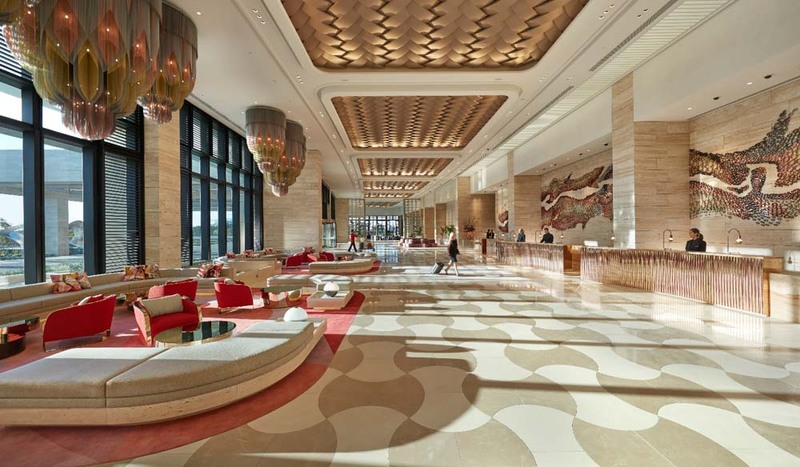 The lobby at Perth’s one-year-old Crown Towers is breathtaking in an ‘is this for real?’ kind of way. Yet there’s no Alice in Wonderland potion at the door; seven-metre-high walls and a bone palette are all that’s needed to create the impression you’ve unknowingly diminished in size. The beautifully designed lobby of Crown Towers, Perth. 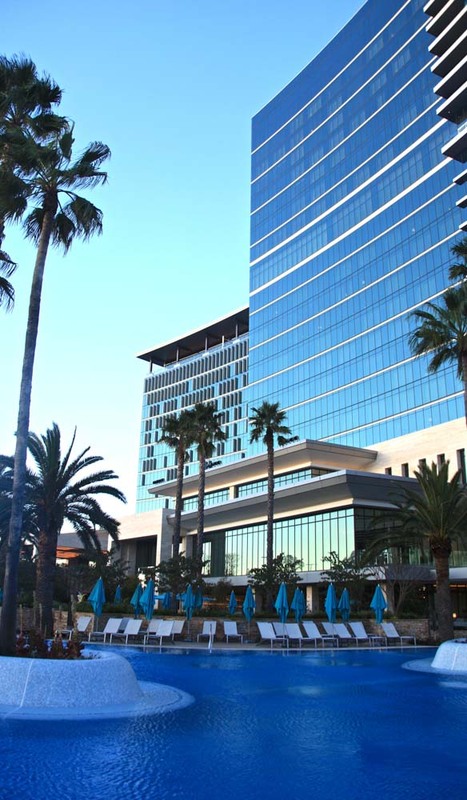 Crown Towers Perth is the most expensive hotel ever built in Australia, costing an eye-watering $650 million. It shows even before you step inside. Set back from the motionless Swan River, its glass entrance is held open by doormen dressed in red knee-length jackets and top hats, like something from Buckingham Palace. We’re unaccustomed to such things in the lower reaches of the southern hemisphere, and while self-contained, laid-on luxury resort jaunts seem second nature when holidaying in Asia, recreating the experience at home is something I’m curious about. Walking towards reception, I almost hear the suction ‘snap!’ of an invisible bubble closing behind me. I take a deep breath of Crown’s rare air – perfumed by a signature scent – and dive in. Pool by sunset at Crown Towers Perth (photo: Fleur Bainger). The cynic in me supposes it’s natural for a giant casino complex to do its utmost to convince guests they need never leave. Crown’s western playground has, after all, created an almost-island of three hotels (one that looks like a cruise ship), 20 bars, 19 restaurants – Nobu, Rockpool and Bistro Guillaume among them – a couple of spas, Vegas-style pools, gyms and that uncomfortably flashy games floor sweeping from pokies to blackjack tables and private enclaves for high rollers. Happily, Crown Towers departs from the casino vibe. You could easily exit one of its 500 rooms and not even know about the trilling bells and spilling coins – a big part of the appeal for many. How much a night, do you say? It’s also surprisingly affordable. Room rates may have started at $595 (yes, started), but a perfect storm involving a load of other hotel openings coupled with a downturn in WA’s economy-driving mining sector has seen rates tumble to $298 (again with the ‘from’ price). The Towers’ other-level luxury is suddenly far more accessible. Time-poor locals have been using it as an alternative to Bali. Its opening hook wasn’t the multi-tiered, heated, outdoor lagoon pool though, or the immense spa modelled on Roman baths. It was its ownership of the largest chocolate fountain in the southern hemisphere. At 1.5 metres tall, the altar to melted cacao even flows at breakfast. And there are takers. 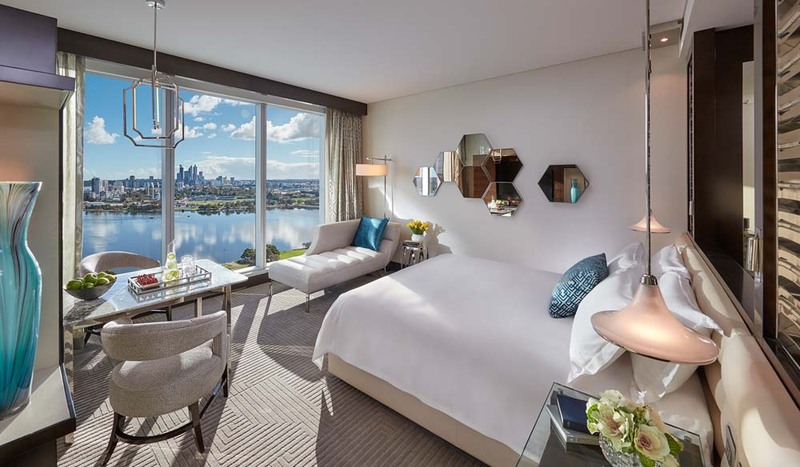 Premier King room, Crown, Towers Perth (photo: Fleur Bainger). I’m distracted by the sheer volume of food in Epicurean restaurant: I roam past yoghurt in multiple flavours, pert strawberries, piles of cured salmon, Chinese dumplings, blood sausage, handmade chocolates and cupcakes. As someone who sneers at buffets, this one resets my perceptions. Serviettes are linen; staff are waistcoated. Ignoring the electronic eye on the ceiling above, I swipe a treat for later. It seems a less than subtle hint to place a gym next door. Averting my eyes (even though the exercise bikes have virtual reality routes to ride), I punch the lift button for the shiny chrome, lacquered wood and white marble sanctuary of my view-enhanced Premier King room. The pyramid of skyscrapers that forms Perth’s city skyline are bang on the horizon; below, the palm-fringed pool and a riverside walking path; to the right, the new Perth Stadium, set to blast open with an Ed Sheeran concert in March 2018. WA’s new 60,000-seat home of the AFL will be surrounded by an entertainment precinct slotting in a microbrewery, outdoor movie amphitheatre, boardwalks, restaurants and barbecue zones. A still-under-construction river bridge will connect it to the eastern CBD. Clever Crown is in prime position for travellers catching games and gigs. That’s if they make it outside. Flicking a switch to close the electric drapes, I pad over the plush carpet to the stone scoop bath that is so long my toes don’t touch the end. A TV screen is set into the tile wall – pure genius. I have plenty to keep me busy. 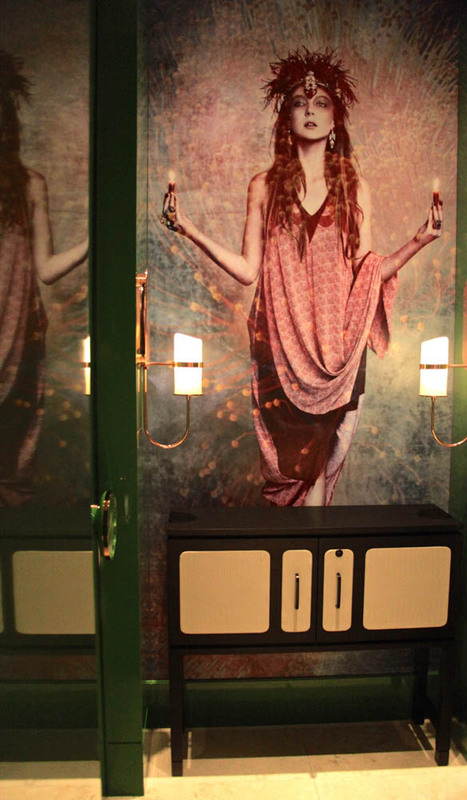 One of the public bathrooms at the Crown Towers (photo: Fleur Bainger). Reluctantly switching my weighty, lined robe for a dress, I hit the lobby, turning away from the boutique-rimmed hall leading to the casino (OK, I may have lingered at Paspaley pearls). Instead, I head to the Towers’ bar, TWR. 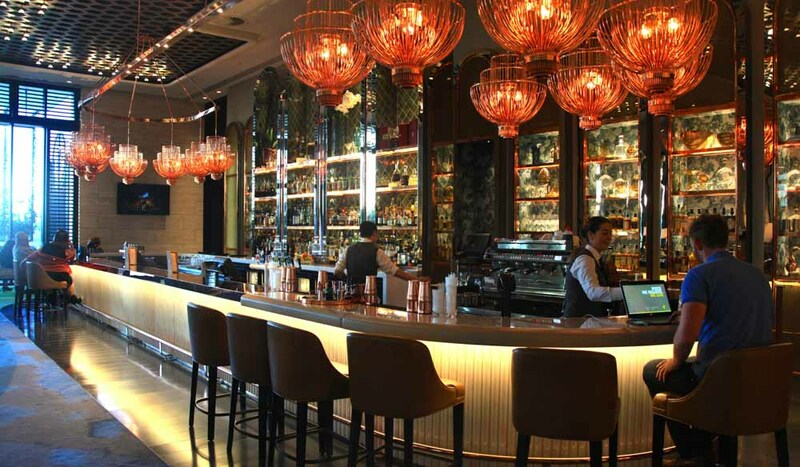 The Waiting Room is like something out of Shanghai, its sultry opulence and gentle illumination hitting every sensory node. TWR, aka The Waiting Room, Crown Towers Perth (photo: Fleur Bainger). It takes me two days to learn there’s a regular shuttle to nearby Burswood train station, from where I can rail into the city, seven minutes away. An Uber can whisk me into Perth’s city centre in 15 minutes, about the same for the airport, and the concierge desk will arrange for me to go anywhere I desire. But he’s got a point, and I feel it too. We’re both in the bubble. It’s blissful in Crown’s parallel universe, aside from the nagging feeling that there’s a world out there being ignored. Maybe I’ll pop out tomorrow.